Motovun Istria (itl. Montona) is a small hilltop town in Croatia. Many people compare Istria to Tuscany, and one of the reasons are hillside towns like Motovun. Frank doesn't particularly like to compare one region to another, or one country to another, as in his opinion every place is unique in its own way. However, the other day somewhere on the Internet, Frank read description of Istria, as Tuscany but with color. He kind of liked it. Motovun is situated on the top of the hill, above river Mirna. The area is very well known among foodies, because the nearby forests are full of hidden treasure: black and white truffles. What to do in Motovun Istria? 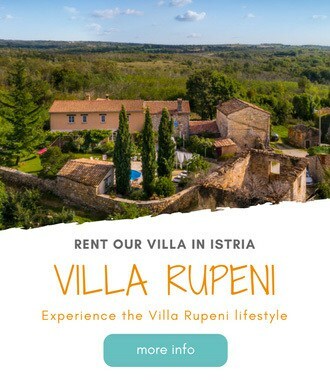 Where to stay in Motovun Istria? The largest truffle in the world was found in forests of Motovun Istria back in 1999. The founder, Giancarlo Zigante, still holds the world record in Guinness book of records for the largest white truffle ever found in the world. White truffle (Tuber Magnatum Pico) was 19.5 cm long, 12.4 cm wide, 13.5 cm tall and weighed 1.31 kg. Its value at the time was estimated at 5.000 $, but Giancarlo decided not to sell it abroad: Instead he sold it locally and made many foodies from around the world come to Istria. This definitely helped to put Istria on the world map regarding truffles. Giancarlo Zigante with its brand Zigante Tartufi is today the leading brand in truffle production and sales in Croatia, and he is the number one exporter to USA. Motovun is really beautiful medieval walled town. It is quite small with only 500 inhabitants. In Motovun, you will find few galleries, souvenir shops offering local products (grappa and truffles), few bars and restaurants and one hotel. Although today in Istria almost everybody produces extra Virgin olive oil of excellent quality, some producers are more famous than others. In Motovun area, you can visit two olive oil producers, whose olive oils are considered one of the best in Croatia. It is Giancarlo Zigante and Klaudio Ipsa. They are both featured in a prestigious olive oil guide Flos Olei. Zigante's biological extra virgin olive oil is voted the best in its category, scoring 95 points out of 100, while Ipsa's Frantoio is voted the best single sort Extra Virgin Olive Oil – Medium Fruity, winning 96 out of 100 points in its category. Zigante olive oils as well as his other products you can taste either in his restaurants or in one of his many stores. Ipsa estate is located just north off Motovun, half way up into the mountains in the village of the same name. On the way to Ipsa estate you pass by his olive groves planted on the terraces in the stunning scenery. Tasting room is small and you need to make an appointment. Ipsa produces 3 blended extra Virgin olive oils, and two single sort olive oils. The old railroad connecting Trieste with Porec was passing at the foothill of Motovun. The railways were dismantled during the WWII and they were shipped to Africa, but the boat sank in the Mediterranean. Today, the old Parenzana is cleaned, maintained and used as a bicycle path. There is even an annual competitive MTB bicycle race happening in late September. The race is included in the calendar of World Cycling Federation (UCI) and it si characterized as medium difficulty. It is three days event for competitive MTB race, recreational cycling race for all age groups, and also a competition in cross country for elementary school students, competition for ultra-marathon and recreational hiking event. Every year in October and November Motovun, as well as other neighboring villages, get full of visitors who come for the Truffle Days – White Truffle Fair. Festival takes place in Livade, a village directly beneath Motovun, for seven weekends starting from the first week of October until mid November. The admission is free. Local artisans sell liqueurs, fresh mushrooms, and cheese. Wine makers present their wines and for 20 kn you can drink all the wine you want. There are cooking shows going on at certain hours where you can enjoy watching cooks shaving white truffles over the pasta and similar fun activities. The samples are given away for free. Motovun Film Festival takes place in late July/ early August. It usually lasts for 5 days. It takes place since 1999. Festival is dedicated to small and independent production. Motovun becomes an open air cinema with its evening outdoor screening. You can enjoy this 18 hours film marathon, as over 70 films are being shown daily from 10 am until 4 am. Festival is really popular among youth, but every year it gathers more and more people. You can put your tent up and the only thing you need to pay for lodging is a tourist tax (less than a euro a day per person). Dress code is short pants, long speeches are forbidden and official food is popcorn. Konoba Mondo is a small restaurant just outside the main town gate. Menu at Mondo is based on the simple, local ingredients, mostly truffles. As suggested at New York Times try beef carpaccio with black truffles shaving, polenta or home made pasta with truffle sauce. No matter how hungry you are don't eat at the restaurant “Pod voltom”. The place is nicely located and it is cute, but the service is disaster. It is one of the real tourist traps. If they judge you are going to spend a little, they don't even want to serve you. So if you are looking for just a bite, or a soup during the day, your chances of not being allowed there are pretty high if you are there during the busy season. Very impolite staff. It is a restaurant belonging to the hotel of the same name. It has a really nice terrace under the big trees and the food they serve is honest and tasty. Restaurant Zigante is located in Livade, a little village just underneath Motovun. Zigante is one of the very well known restaurants in Croatia. It is an upscale place based on slow food concept. Its menu heavily relies on truffles (you can even have ice cream with truffles!). Zigante serves excellent olive oil of his own production. The place is pricey but it is worth the experience. Rural house Toncic is located in a tiny village Zrenj, near Oprtalj, and some 15 km away from Motovun. The food is home made with ingredients produced by the owners. It is family run restaurant. The view from the terrace is stunning. Simple food, excellent setting, and really good prices. Located in the main square of Motovun charming old town, hotel Kastel is the only hotel in Motovun. Hotel has been refurbished recently. There is an indoor swimming pool as well as wellness facilities. Hotel has 33 rooms. Some rooms have a view over the main square and others over the valley, vineyards and olive groves. Tip: Not all rooms are air conditioned, so make sure to ask for air-conditioned room when booking. The other day Frank went for a walk to Motovun and got surprised seeing his aquitance Slaven there. Slaven showed him his new project – a red house with ten rooms that he just rented out for the full year. He is planning to run his own hotel in Motovun. The hotel until last year was run by another owner, and you can see some photos here. Slaven has big plans for his place and for him it is a dream come true. He said he and his girlfriend were always dreaming of running their own hostel. He didn't know where and when, but now he finally got a courage to make his dream come true with this 10 rooms hotel in Motovun. He is renovating a place a little bit. As soon as the renovation is done, I will add some photos. The hotel has beautiful terrace looking over Mirna valley, surrounding hills and olive and wine groves. In the villages around Motovun, there are many private villas to rent. They are beautifully restored, old Istrian stone houses, and mostly all of them feature an outdoor swimming pool.